Many companies in the B2B sector are using LinkedIn for brand awareness, marketing, recruitment and to build authority and influence online. Therefore if your organisation is expanding into new markets it makes sense to translate LinkedIn posts and localise your LinkedIn company page for potential customers in that country. 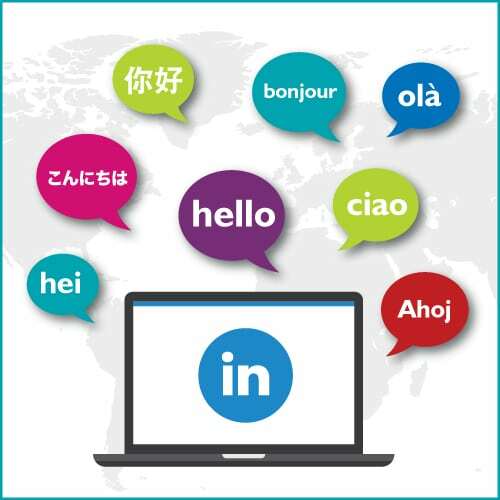 Social media translations need to be localised for your target market and no more so than on LinkedIn where a highly professional image is needed. This means accurate translations are essential, as any mistakes could reflect poorly on your company image. It is also important to consider business etiquette in that market, casual or more consumer friendly updates may not be appropriate. Is your target market on LinkedIn? LinkedIn boosts 500 million professional users around the world and is available in 24 languages including, Arabic, Chinese, English, French, German, Italian, Portuguese, Spanish, Dutch, Swedish, Danish, Romanian, Russian, Turkish, Japanese, Czech, Polish, Korean, Indonesian, Malay, and Tagalog. However, unless blocked by governments, anyone can access it around the world. Users can also create their profile in more than one language. For example some of our native speaking linguists have a profile in English as well as in their native language. People using LinkedIn will then see the profile in the language they are using LinkedIn in, or they can select their preferred language. In many cases it will be important for individuals within your business to optimise their professional LinkedIn profiles for your target market. LinkedIn is a professional network where online networking happens between people, not company pages. Therefore if you have UK-based employees who will be talking to business people in the new market, it could be advantageous to create secondary profiles in the native language. LinkedIn also allows businesses to run multilingual company pages. When you add a new company page in a different language, LinkedIn will automatically translate all the section headers into that language. But not your content. Therefore you will need to translate this information into the target language, which is also a good opportunity to localise the content for the market. Instead of translating your English company description directly into the target language, localise your content to make it more relevant to the people you wish to do business with in that country. Similarly contact information and links to websites etc., can all be localised with country / market-specific details. Once you have your company pages set up in your target language, and perhaps key personnel have multilingual profiles, you need to think about how to translate LinkedIn posts. Most clients we work with create a monthly content calendar of social media updates aligned with the target market, and these are translated and scheduled for publication. Often business leaders also require LinkedIn Pulse posts translated to build their influence in new markets, and they may also need some posts translated for their professional profile. But as well as translating brand messages and marketing content, LinkedIn requires engagement. It’s an opportunity to network with other businesses and build relationships in your target market. Therefore you may require some ad-hoc translation work so that your business can reply to comments or have a conversation with prospects overseas. If you have a native speaker or someone who is fluent in your target language, they may be able to provide this language support. Alternatively a translation service provider like Comtec, offer a range of marketing translation services including social media engagement. To find out more about our social media translation services, contact our friendly team to discuss how your company can use LinkedIn to reach new markets more effectively.